In a brief text from 1989 entitled Nagual Art, William S. Burroughs reminds us that in the books by Carlos Castaneda, Don Juan makes a distinction between two different universes: Tonal and Nagual. The Tonal universe is the daily universe of cause and effect, which is predictable because it has already been recorded. Meanwhile, Nagual is an unknown, unstable universe, open to the future. In order for Nagual to be fully realized, the doors must be opened wide to chance. The magical thinking in Carlos Castaneda’s work distinguishes the duality inherent in the order of things: one is Tonal, which is a recording of reality, almost a statistical confirmation, and another, Nagual, which derives from the eruption of randomness, capable of opening up to new and unpredictable forms of reality. 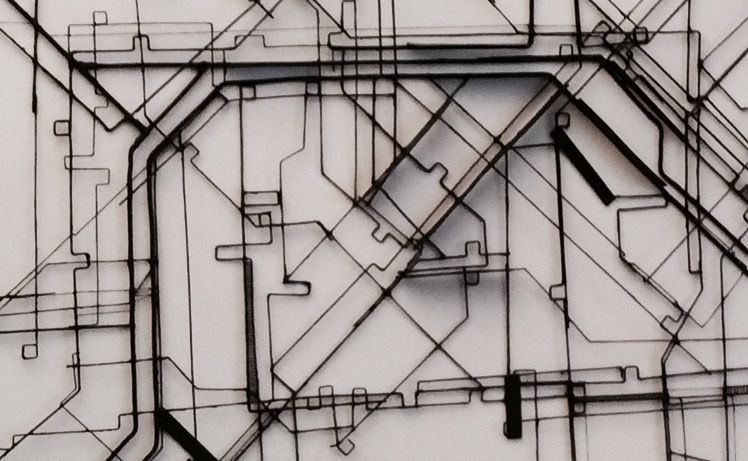 Likewise, Isabella Angelantoni Geiger’s monochrome structures in wire, thread, paper and ribbons contain both of these moments; the need for rationality, which is based on architectural design, as well as the need for randomness or “fertile instability”, which flows from freehand drawings and compositional and functional freedom. From these elements, an idea for sculptures emerges which is essentially open in terms of shape and which is dynamic in its intentions. An attempt is made to convince the world to abandon mass and weight, which have always been fundamental traits in classical sculpture. In the case of Isabella’s work, the dependency on drawing represents a step forward; her sculptures do not rely on mass and volume in relation to space, rather they rely on a search for an open shape which become space and give a sense of life. In other words, her sculptures are cursive rather than cohesive, as if they were scribbles in the air. Rather than searching for a reference point on a horizontal plain, they rise up from the earth and search for an ideal movement in space, which they unilaterally occupy vertically, horizontally, or suspended and, perhaps in the future, even floating on air. Rather than conform to an ideal of containment and assembly, her sculpture contains essential details and the observer is invited to pass through it, not only visually but also by challenging accepted dogmas related to stability, craft and definition. Isabella A. Geiger’s sculpture is open and cursive, whose origins are from the world of architectural design, but whose inspiration is mostly literary and imaginative. It is as if it were a scale in which the tray containing Invisible Cities by Italo Calvino weighed more than the tray containing the landscapes of real historical cities. The “esprit de geometrie” does not exceed the “esprit de finesse”, allowing these open, modular structure areas to take flight. Their fluid and unpredictable shape allows them to interfere with the longitudinal trends which contain them, thus making them more forma mentis than forma urbis. Light accompanies and enhances this happy imaginative indefiniteness and caresses the sculptures when their shadows thicken or slip away as they are projected on the walls which receive them. The shadows leave their trace like the shadows projected in Plato’s cave. What is real? Which is the original and which is the projection? What defines the structure and how much remains in view? Isabella A. Geiger’s sculptures do not respond assertively or unequivocally, nor do they evade these questions. Instead, the response is expansive and probing. These are the characteristics that strongly distinguish Isabella’s work: sculptures that are outside of a traditional framework, overcoming the sense of contemplative wonder between the observer and the work, breaking down the walls of art. Her work brings a sense of continuity between spatial dimensions through a physical gap in the material world created by thought and imagination and it is as if there is a dilation of the finite space contained in the work which reaches a mental space where the observer can enter or exit freely. It is as if her sculptures allow you to have a psycho-sensorial experience. The center of the work no longer exists; instead there is a dissemination of observation points as the viewer moves around the work. The work is a cross between different categories of art, expressive forms and language: painting, sculpture, architecture and interior design. The language is interdisciplinary and eclectic. The sculptures are basically inscribed in regular geometric shapes, mainly parallelepipeds or cubes, from which unpredictable developments grow, so that the central structure opens up to the possibility of becoming and describing eccentric evolutions. Graphic traces appear and never repeat themselves even though they are characterized by a singular yet precarious harmony. It is the design of chaos. The artist describes curves that could extend to infinity, even though they are traced within a finite space whose irregularity is constant among hundreds of turning points that reveal the harmony underlying an apparently chaotic phenomenon. These curves and turning points introduce disorder and unpredictability and remind you of Nature’s complexity. In the end, the artist’s ecological experience can be viewed as anti letteram. We can see this in the way she unconditionally embraces the multiplicity of reality; in the apparent disorderly richness of her compositions; in the accumulation of elements, in the impact of industrial waste and the remains of the material world. We can see it in her use of different techniques and a variety of materials which reflect the versatility of life and daily contradictions. Most definitely, for Isabella A. Geiger, sculpture is an essentially figurative genre, whose plasticity assumes free and open forms that are not threatening and do not loom over the observer. Her creative space is occupied by a family of homogeneous shapes that reflect the complexity of living beings. She uses the emotionality of her eyes and the sensibility of her hands to gracefully suggest a form of total contemplation and to search for her relation to the “panta rhei” that surrounds her. The simplicity of the tactile vision of the artist is capable of capturing the complexity of reality, which has always been hidden by random triviality. She is able to penetrate beyond what can be seen and is able to listen to the melodies that emerge from the quiet private conversations with the world. In un breve testo del 1989 intitolato l’Arte Nagual, William S. Burroughs ricorda che nei libri di Carlos Castaneda, Don Juan distingue due universi, uno Tonal e l’altro Nagual. L’universo Tonal è l’universo quotidiano dei rapporti di causa-effetto, prevedibili perché già registrati, mentre quello Nagual è l’universo sconosciuto, instabile e aperto al divenire. Perché il Nagual abbia piena realizzazione bisogna spalancare la porta al caso. Il pensiero magico trattato nei libri di Carlos Castaneda distingue così una doppia modalità insita nell’ordine delle cose, una Tonal, di pura registrazione della realtà, quasi una sua conferma statistica, e un’altra Nagual, che deriva dall’irruzione del caso, capace di aprirsi a nuove e imprevedibili forme della realtà. Anche le strutture monocrome in ferro, filo e listarelle di cartone di Isabella Angelantoni Geiger racchiudono questi due momenti, quello della necessità o della razionalità, che si basa sul progetto architettonico e quello del caso o della sua fertile instabilità, che parte invece dal disegno a mano libera e dalla sua libertà compositiva e funzionale. Ne nasce un’idea di scultura, essenzialmente aperta nelle forme e dinamica nelle intenzioni, che cerca di far dimenticare al mondo la sua massa e il suo peso, che sono da sempre totem e tabù della scultura classica. Qui invece, come si diceva poco sopra, la dipendenza dal disegno segna un passo in avanti, nel senso che queste sculture non si impongono per massa e volume in rapporto allo spazio, ma per la ricerca di una forma aperta che si fa essa stessa spazio e ambiente di vita. In altre parole le sculture di Isabella Angelantoni Geiger non sono coesive ma corsive, come fossero uno scarabocchio nell’aria. Lungi dal ricercare un punto di appoggio e di stabilità su un piano orizzontale, esse si sollevano da terra e cercano un movimento ideale nello spazio, che occupano unilateralmente in verticale, in orizzontale, sospese e in futuro chissà, forse anche fluttuanti in aria. Lungi dal conformarsi a un ideale di contenimento e di assemblaggio, qui la scultura è essenzialmente articolata e si rivolge allo spettatore invitandolo ad attraversarla, non solo con lo sguardo, sfidando dogmi quali la stabilità, la finitezza e la definizione. Corsiva e aperta è dunque la scultura di Isabella Angelantoni Geiger, la cui origine è si nel mondo del progetto architettonico, ma la cui ispirazione è soprattutto letteraria e immaginativa, come se si trattasse di una bilancia in cui il piatto delle Città Invisibili di Italo Calvino pesa di più che non quello dei rilievi planimetrici delle città storiche. L’esprit de geometrie qui non eccede l’esprit de finesse, che è invece quanto permette a queste aeree strutture modulari e aperte di spiccare il volo liberandosi nello spazio, di interferire con la loro forma fluida e imprevedibile sull’andamento longitudinale delle rette che le compongono e quindi di essere più forma mentis che non forma urbis. La luce accompagna e favorisce questa felice indefinizione immaginativa e accarezza le sculture con l’addensarsi e lo scivolare delle proiezioni delle loro ombre sui muri degli spazi che le accolgono, su cui si imprimono le loro tracce disegnate come le ombre proiettate nella caverna di Platone. Cosa è reale? Quale è l’originale e quale è la proiezione? Cosa definisce la struttura e quanto ne rimane alla vista? La scultura di Isabella Angelantoni Geiger non si sottrae a queste domande, a cui non risponde in modo assertivo e univoco, ma interrogativo ed espansivo. Ecco dunque le caratteristiche che con forza contraddistinguono queste opere: uscita della scultura dalla sua cornice tradizionale, superamento del rapporto di soggezione contemplativa tra spettatore e opera, sfondamento del muro dell’arte, rapporto di continuità tra le dimensioni dello spazio attraverso un varco fisico nella materia creato dal pensiero e dall’immaginazione, dilatazione dello spazio finito dell’opera fino ad arrivare allo spazio-ambiente mentale in cui lo spettatore è libero di entrare o uscire, scultura da vivere come esperienza psico-sensoriale. Non esiste più un centro dell’opera, ma una disseminazione di punti di osservazione legati agli spostamenti fisici dello spettatore. Un’opera che è un intreccio di diverse categorie dell’arte, forme espressive e linguaggi: pittura, scultura, architettura e anche arredamento, dunque un linguaggio interdisciplinare ed eclettico. Di base queste sculture sono inscrivibili in forme geometriche regolari, per lo più parallelepipedi o cubi, da cui germinano però irradiazioni e sviluppi imprevedibili che divelgono la struttura centrale aprendola alla possibilità del divenire e descrivendo evoluzioni eccentriche, tragitti grafici che non si ripetono mai uguali pur essendo dotati di una singolare quanto precaria armonia: è il disegno del caos. L’artista così descrive curve che si potrebbero estendere all’infinito, seppur agendo all’interno di uno spazio finito il cui grado di irregolarità si mantiene costante attraverso centinaia di biforcazioni che svelano l’armonia sottostante a un fenomeno apparentemente caotico, che introducono disordine e imprevedibilità nel calcolo formalizzato della previsione e che riportano l’attenzione alla complessità della natura. Dopotutto la sua è un’esperienza ecologica ante litteram, nel suo porsi incondizionatamente all’unisono con la molteplicità del reale, nella ricchezza apparentemente disordinata delle composizioni, nell’accumulo degli elementi, delle impronte degli scarti industriali e dei reperti della vita materiale, nell’utilizzo di tecniche diverse e di materiali eterogenei che riflettono la poliedricità della vita e le contraddizioni del quotidiano. In definitiva per Isabella Angelantoni Geiger la scultura è un genere essenzialmente figurativo la cui plasticità assume forme libere e aperte che non minacciano e non incombono sullo spettatore. Una famiglia di forme omogenee che rispecchiano la complessità del vivente presiede il suo spazio creativo ed essa si serve dell’emotività dell’occhio e della sensibilità della mano per suggerire con garbo una forma di contemplazione totale che va alla ricerca della sua relazione con il “panta rei” che la circonda. La semplicità dello sguardo tattile dell’artista qui è capace di cogliere la complessità del reale che da sempre si nasconde dietro la banalità del caso, penetrando oltre la soglia dei fenomeni e ascoltando la melodia del suo sommesso colloquio privato col mondo.